What makes the Guidebook so valuable, besides detailed segment-by-segment descriptions and maps, is the high quality, expressive photographs it contains. Most of the pictures were taken, not by professional photographers, but by trail enthusiasts who snapped the shot while out hiking! Each photo wonderfully captures the beauty of the trail experience. 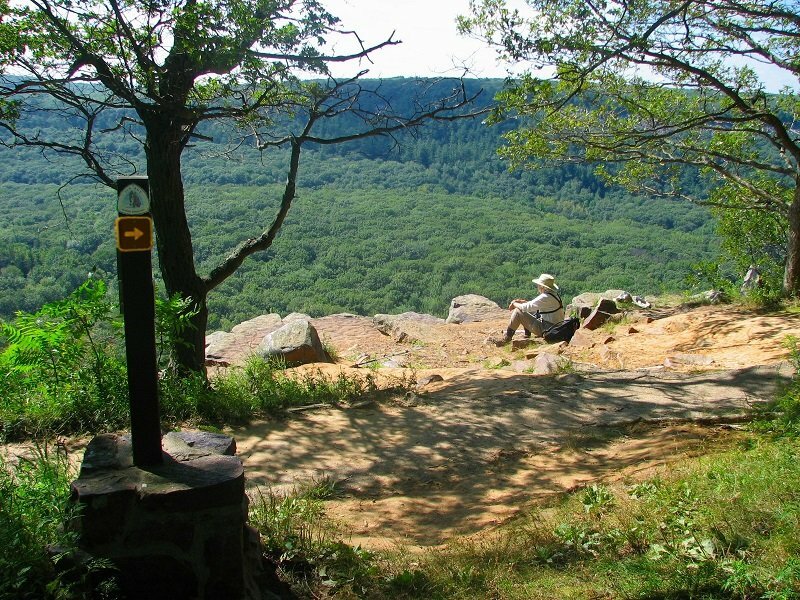 A hiker rejuvenating in the breath-taking view of Devil’s Lake State Park, Sauk County. 1 – 5 of your favorite photographs. We request the original file, not a downsized version. We need as many pixels as possible for print reproduction. It is always helpful if a yellow blaze is present in the photograph to establish Ice Age Trail identity. Vertically oriented photographs are rare, so please send us some of those, too! If your photograph(s) are selected for use in the 2020 Ice Age Trail Guidebook your name will appear in the photo credits and you will receive a free copy of the Guidebook, a $30.00 value. If your photograph(s) are selected for other publication purposes, say an IATA blog post, your name will appear in the photo credits, and you’ll get the thrill of knowing your photo helped express the key point in a story. And, yes, lots of LOVE. You will receive our immense appreciation for so generously sharing your love of beauty and of the Trail with us in this way. This entry was posted in Uncategorized and tagged Hiking, Photo Contest, Trail Photography, Volunteers. Bookmark the permalink.